As per the World Health Organization (WHO) statistics, globally more than one billion people require one or more assistive products. Moreover, with the aging global population and rise in the non-communicable diseases, more than two billion people will need at least one assistive product by 2050, with several older people needing two or more. Furthermore, an estimated 285 million people are visually impaired worldwide. Around 70 million people need a wheelchair, and another 360 million people globally, have moderate to profound hearing loss. The rates of disability are increasing due to aging populations and increase in chronic health conditions, which increases the medical assistive technologies' adoption rate. However, people with disabilities have lesser access to healthcare services, and therefore, unfulfilled health care needs. The assistive devices and technologies related to the hearing and vision are defined by the World Health Organization (WHO), as prosthetics, mobility aides, hearing aids, visual aids, and specialized computer software and hardware increase mobility, hearing, vision and communication capacities. These technologies are of immense help to the people with special needs, for instance, to the people with physical challenges, for living a self-dependent, and dignified life, ensuring a regular, active, and healthy social interaction. Disability, which is a complex and multi-dimensional term refers to impairments, limitations on the activity, and restrictions on the participation which is a combination of medical, and contextual factors. There prevail diversified facets among the people with medical impairment i.e. some are born with a disabling condition, others acquire a disability through injury or a chronic disease, while others develop a disability at an older age. However, the health needs for disabled people also vary depending on the type of limitation, and the primary health conditions in which some require high healthcare needs while others do not. This research study includes an extensive analysis of the global medical assistive technologies market by product, end-user and geographical regions, allowing the researcher to develop a comprehensive outlook of the market. Each of these segments has been analyzed based on their current and future market size, considering the macro and micro environmental factors. The market report presents a detailed and investigative study of the entire market and provides a comprehensive insight into various forms of development, trends and the key market participants. While highlighting the key driving and restraining forces for this dynamic market, the report also provides a comprehensive section on competitive landscape, market share analysis, competitive benchmarking, and the position of the competitors within the global medical assistive technologies market. 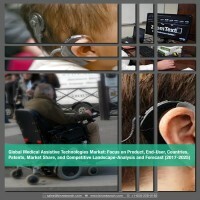 • What are the major market drivers, challenges and opportunities of the global medical assistive technologies market? • How did the advanced assistive technologies evolve and what is its scope in the future? • What were the market shares of the leading segments and sub-segments of the global medical assistive technologies market in 2016 and what will be the shares in 2025? • How will each of the segments of the global medical assistive technologies market grow during the forecast period and what will be the revenue generated by each of the segments by the end of 2025? • How will the medical assistive industry evolve during the forecast period 2017-2025? • Which product, and end-user will dominate the global medical assistive technologies market by the end of the forecast period and which one is growing at the highest CAGR during the forecast period 2017-2025? • What will be the growth rate of different segments during the forecast period? Which is the leading segment by product, end-user and region? • Who are the key players in the global medical assistive technologies market? • Which region will lead the global medical assistive technologies market in revenue generation through the forecast period? The key players who have significant contributions to the medical assistive technologies market are Sonova Holding AG, William Demant Holding, Sunrise Medical, GN ReSound Group, Invacare Corporation, Med-El, Sivantos Ltd., VFO Group, Starkey Hearing Technologies and OttoBock Healthcare GmbH among others. 8.21 Ekso Bionics Holdings Inc.
32 Overview: Karma Mobility Ltd.
49 Overview: Esko Bionics Holdings, Inc.
50 Overview: Liberating Technologies, Inc.
52 Overview: Sivantos Pte. Ltd.
40 Some of the factors driving the growth of this market in the U.S. The medical assistive technologies stands as one of the pivotal advancements in the healthcare industry, and still striving to develop more advanced form of devices. The market for the medical assistive technologies is currently growing at an exponential rate due to active participation of the government and industry players in continuous advancement of medical assistive technologies through transition from traditional to the next generation medical assistive devices. Furthermore, the market is driven by several factors which include the rise in geriatric and disabled population, and in the demand for assistive technologies due to the increasing preference for independent/self-dependent lifestyles among people. As per the World Health Organization (WHO) statistics, globally more than one billion people require one or more assistive products. With the aging global population and rise in the non-communicable diseases, it is estimated that more than two billion people will need at least one assistive product by 2050, with several older people needing two or more. Moreover, an estimated 285 million people are visually impaired worldwide. Around 70 million people need a wheelchair, and another 360 million people globally, have moderate to profound hearing loss. The rates of disability are increasing due to aging population and increase in chronic health conditions, which increases the adoption rate of medical assistive technologies. More than 46% of older people, those aged 60 years and above, have disabilities and more than 250 million older people experience moderate to severe disability. As per the data from the World Population Prospects, the number of older persons has increased substantially in the recent years in most of the countries, and the growth is projected to significantly accelerate in the coming decades reaching 2.1 billion by 2050. The devices that assist the elderly, and disabled people in their day-to-day activities such as, movement, listening and reading are termed as medical assistive technology devices. The assistive technology is an umbrella term covering the systems and services related to the delivery of assistive products and services. These technologies maintain or improve an individual’s independent functioning and thereby promoting their overall well-being. These devices are both simple, and complex in design. Devices such as, wheelchairs, cranes, crutches and scooters are simple in design while hearing aids, reading machines, and transfer lifts represent the design complexity. The global medical assistive technologies market had witnessed significant development and have evolved both in terms of performance and characteristics. Access to the assistive devices is essential for the people with challenges (including elderly people) for a harmonious interaction in all the spheres of life. As per the U.S. Census Bureau, the geriatric population is expected to increase from 8.5% in 2015 to 12% in 2030. Furthermore, Asia and Latin America are the primary regions which are expected to witness rapidly ageing population. As per the World Health Organization (WHO), the world is on the brink of a demographic milestone. In about five to six years down the line, the number of people aged 65 years or older will outnumber the children under the age of five. Driven by the falling fertility rates and increase in the life expectancy, population aging is expected to continue. Further, approximately 15% of the world’s population lives with some form of disability of whom 2%-4% experience significant difficulty in functioning. Moreover, the increase in the number of manufacturers investing in the R&D activities of these technologies further increases the growth of the market. The rise in the technological advancements has significantly revolutionized the medical assistive technologies. The introduction of powered wheelchairs in the market has eased the life of the patients by reducing the time and energy required in its manual operation. Furthermore, the Cochlear implants have also reduced the need for externally wearing the hearing aids. These technologically advanced products are gaining acceptance among the end-users, and hence, demand for the same is increasing. The assistive devices and technologies defined by the World Health Organization (WHO) comprises prosthetics, mobility aids, hearing aids, visual aids and specialized computer software. These technologies are of immense help to the people with special needs, for instance, to the people with physical challenges, for living a self-dependent, and dignified life, ensuring a regular, active and healthy social interaction. Disability, which is a complex and multi-dimensional term refers to impairments, limitations on the activity, and restrictions on the participation which is a combination of medical, and contextual factors. There prevail diversified facets among the people with medical impairment i.e., some are born with a disabling condition, others acquire a disability through injury or a chronic disease, while others develop a disability at an older age. However, the health needs for disabled people also vary depending on the type of limitation, and the primary health conditions in which some require high healthcare needs while others do not. The way disability is addressed has shifted from purely medical approach to one that focuses on maximum functioning and well-being. The medical assistive technologies now cover sophisticated information & communications technology (ICT), software, cyber-physical and stem cell applications, neuroprosthetics, humanoid robots and applications (apps). The assistive devices can help individuals with disabilities to achieve greater independent lifestyles. The devices have been commonly used in the developed countries to help individuals with disabilities to overcome the obstacles when seeking medical treatment, pursuing education, obtaining employment or caring for families, and obtaining equal opportunities to participate in the society. However, in several low-income and middle-income countries, only 5%-15% of people who need the medical assistive devices and technologies have actually access to them. The product segment of the market comprises of hearing aids & devices (behind the ear aids, receiver in the ear aids, in the ear hearing aids, cochlear implants, and bone anchored systems, among others), mobility assistance aids (manual wheelchair, electric wheelchair, and mobility scooters, among others) and vision & speech aids. The hearing aids & devices segment constituted the highest market value in 2016, growing at the CAGR of 4.8% during the forecast period 2017-2025. The growth can be attributed to the large number of people suffering from hearing impairments globally, and the introduction of technologically advanced products such as, cochlear implants, and bone anchored systems (BAHA). However, mobile assistance aid is expected to grow at the highest CAGR of 6.1% during the forecast period 2017-2025. It can be attributed to the rising geriatric population and increasing government support in the form of grants and subsidies for the purchase of mobility devices. The end user segment for the mobility assistance aids include hospitals, homecare and rehabilitation centers, and elderly nursing homes. The hospital acquired the highest market value in 2016 and is anticipated to reach $3.03 billion by 2025. This can be attributed to the growing geriatric population, rising disability rate and widespread adoption of mobile assistive aids in the hospitals in order to meet the growing demand of technologically advanced assistive devices among the patients for improved and independent lifestyles. The end user segment for hearing aids & devices include hospitals, homecare, clinics & physician offices, and diagnostic centers, among others. The hospitals acquired the highest market value of in 2016, growing at the CAGR of 4.0% during the forecast period 2017-2025. This can be attributed to the growing adoption rate of hearing aids among the hospitals to provide hearing assistance and therapies to the hearing-impaired people, and active participation of the government and industry players for the technological advancement of the hearing devices such as, cochlear implant and BAHA with 360 degrees sound coverage and wireless technologies. The end user segment for vision & speech aid include hospitals, homecare, clinics & physician offices and rehab, & elderly nursing homes, among others. The hospitals acquired the highest market value in 2016 and is anticipated to reach $1.16 billion by 2025. This can be attributed to the rising incidence rate of visually & speech impaired population, adoption rate of vision aids such as, braille translators and video magnifiers among the hospitals for providing hearing assistance and therapies to the visually impaired people, and encouragement and funding provided by various national governmental bodies. Europe generated the highest market value of $5.23 billion in 2016. This can be attributed to the rising incidence of various types of acute diseases & disabilities, growing geriatric population, technological advancement in the medical assistive devices, increasing disposable income and support of the government in enhancing the healthcare facilities, and providing reimbursement policies for the end-users. However, RoW, comprising of the Kingdom of Saudi Arabia (KSA), Russia, Israel, and the U.A.E among others, is expected to grow at the highest CAGR of 7.2% during the forecast period 2017-2025, followed by Latin America, owing to the rising incidence rate of chronic diseases, increasing disposable income, and growing awareness of technologically advanced assistive devices, and improvement of the quality of life with their regular usage, among people.